William Ewart Gladstone, statesman, orator, and author, was born in Rodney Street, Liverpool, on December 29, 1809. He is the fourth son of Sir John Gladstone (1764-1851), a well-known, and it might almost be said a famous, Liverpool merchant, who sat for some years in Parliament, and was a devoted friend and supporter of George Canning. Mr. Gladstone is of Scotch descent, on both sides, and has declared more than once in a public speech that the blood that runs in his veins is exclusively Scottish. He was educated at Eton and at Christ Church, Oxford. He became a student at Oxford in 1829, and graduated as a double first-class, in 1831. He had distinguished himself greatly as a speaker in the Oxford Union Debating Society, and had before that time written much in the Eton Miscellany, which indeed he helped to found. He appears to have begun his career as a strong opponent of all advanced measures of political reform. In the Oxford Union he proposed a vote of censure on the government of Lord Grey for introducing the great Reform Bill which was carried in 1832, and on the Duke of Wellington, because of his having yielded to the claims for Catholic emancipation. He also opposed a motion in favor of immediate emancipation of the slaves in the West Indian islands. He soon became known as a young man of promise, who would be able to render good service to the Conservative party in the great struggle which seemed likely to be forced upon them--a struggle, as many thought, for their very existence. It was a time of intense political emotion. Passion and panic alike prevailed. The first great "leap in the dark" had been taken; the Reform Bill was carried, the sceptre of power had passed away from the aristocracy and the privileged ranks to the middle and lower middle classes. The Conservative party were looking eagerly out for young men of promise to stiffen their ranks in the new parliament, the first elected under the Reform Bill, the first which the middle class had their due share in creating; the first in which such cities as Manchester and Liverpool and Birmingham were allowed to have representation. Mr. Gladstone was invited to contest the burgh of Newark in the Conservative interest, and he had the support of the great Newcastle family. He stood for Newark, and he was elected. He delivered his maiden speech on a subject connected with the great movement for the emancipation of the West Indian slaves; but he seems to have confined himself mainly to a defence of the manner in which his father's estates were managed, the course of the debate having brought out some charge against the management of the elder Gladstone's possessions in one of the West Indian islands. The new orator appears to have made a decided impression on the House of Commons. His manner, his voice, his diction, his fluency were alike the subject of praise. Mr. Gladstone evidently continued to impress the House of Commons with a sense of his great parliamentary capacity. We get at this fact rather obliquely; for we do not hear of his creating any great sensation in debate; and to this day some very old members of the House insist that for a long time he was generally regarded as merely a fluent speaker, who talked like one reading from a book. But on the other hand, we find that he is described by Macaulay, in 1839, as "the rising hope" of the "stern and unbending Tories," and the whole tone of Macaulay's essay--a criticism of Gladstone's first serious attempt at authorship, his book on the relations between church and state--shows that the critic treats the author as a young man of undoubted mark and position in the House of Commons. In December, 1834, Sir Robert Peel appointed Gladstone to the office of a Junior Lord of the Treasury. In the next year Peel, who was quick to appreciate the great abilities and the sound commercial knowledge of his new recruit, gave to him the more important post of Under-secretary for the Colonies. Gladstone looked up to Peel with intense admiration. There was much to draw the two men together. Knowledge of finance, thorough understanding and firm grasp of the principles on which a nation's business must be conducted--perhaps, it may be added, a common origin in the middle class--these points of resemblance might well have become points of attraction. But there were other and still higher sympathies to bring them close. The elder and the younger man were alike earnest, profoundly earnest; filled with conscience in every movement of their political and private lives; a good deal too earnest and serious, perhaps, for most of the parliamentary colleagues by whom they were surrounded. Mr. Gladstone always remained devoted to Peel, and knew him perhaps more thoroughly and intimately than any other man was privileged to do. Peel went out of office very soon after he had made Mr. Gladstone Under-secretary for the Colonies. Lord John Russell had brought forward a series of motions on the ominous subject of the Irish Church, and Peel was defeated and resigned. It is almost needless to say that Gladstone went with him. Peel came back again in office in 1841, on the fall of the Melbourne administration, and Mr. Gladstone became Vice-president of the Board of Trade and Master of the Mint, and was at the same time sworn in a member of the Privy Council. In 1843 he became President of the Board of Trade. Early in 1845 he resigned his office because he could not approve of the policy of the government with regard to the Maynooth grant. 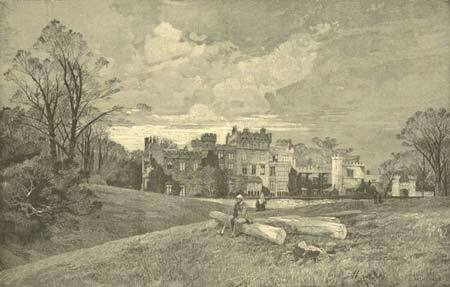 Hawarden Castle, the home of Gladstone. The great struggle on the question of the repeal of the Corn Laws was now coming on. It would be impossible that a man with Mr. Gladstone's turn of mind and early training could have continued a protectionist, when once he applied his intellect and his experience to a practical examination of the subject. Once again he went with his leader. Peel saw that there was nothing for it but to accept the principles of the Free Trade party, who had been bearing the fiery cross of their peaceful and noble agitation all through the country, and were gathering adherents wherever they went. It is a somewhat curious fact that Mr. Gladstone was not in the House of Commons during the eventful session when the great battle of free trade was fought and won. In thorough sympathy with Peel, he had joined the government again as Colonial Secretary. Knowing that he could no longer be in political sympathy with the Duke of Newcastle, whose influence had obtained for him the representation of Newark, he had given up his seat, and did not come into Parliament again until the struggle was over. At the general elections in 1847, Mr. Gladstone, still accepted as a Tory, was chosen one of the representatives for the University of Oxford. Up to the time of the abolition of the Corn Laws, or at least of the movement which led to their abolition, Mr. Gladstone had been a Tory of a rather old-fashioned school. The corn-law agitation probably first set him thinking over the possible defects of the social and legislative system, and showed him the necessity for reform at least in one direction. The interests of religion itself at one time seemed to him to be bound up with the principles of the Tory party; and no doubt there was a period of his career when the principle of protection would have seemed to him as sacred as any other part of the creed. With a mind like his, inquiry once started, must go on. There was always something impetuous in the workings of his intellect, as well as the rush of his sympathy. He startled Europe, and indeed the whole civilized world, by the terrible and only too truthful description which he gave, in 1851, of the condition of the prisons of Naples under the king who was known by the nickname of "Bomba," and the cruelties which were inflicted on political prisoners in particular. Again and again, in Mr. Gladstone's public life we shall see him carried away by the same generous and passionate emotion on behalf of the victims of despotic cruelty in any part of the world. Burke himself could not be more sympathetic, more earnest, or more strong. By the death of Sir Robert Peel, in 1850, Mr. Gladstone had lost a trusted leader, and a dear friend. But the loss of his leader had brought Gladstone himself more directly to the front. It was not till after Peel's death that he compelled the House of Commons and the country to recognize in him a supreme master of parliamentary debate. The first really great speech made by Mr. Gladstone in Parliament--the first speech which would fairly challenge comparison with any of the finest speeches of a past day--was made in the debate on Mr. Disraeli's budget in the winter of 1852, the first session of the new Parliament. Mr. Disraeli knew well that his government was doomed to fall. He knew that it could not survive that debate. It was always one of Mr. Disraeli's peculiarities that he could fight most brilliantly when he knew that his cause was already lost. That which would have disheartened and disarmed other men, seemed only to animate him with all Macbeth's wild courage of despair. Never did his gift of satire, of invective, and of epithet show to more splendid effect than in the speech with which he closed his part of the debate, and mercilessly assailed his opponents. Mr. Disraeli sat down at two o'clock in the morning, and then Mr. Gladstone rose to reply to him. Most men in the House, even on the opposition side, were filled with the belief that it would be impossible to make any real impression on the House after such a speech as that of Mr. Disraeli. Long before Mr. Gladstone had concluded, everyone admitted that the effect of Mr. Disraeli's speech had been outdone and outshone. From that hour Mr. Gladstone was recognized as one of the great historic orators of the English Parliament--a man to rank with Bolingbroke and Chatham and Pitt and Fox. With that speech began the long parliamentary duel between these two great masters of debate, Mr. Gladstone and Mr. Disraeli, which was carried on for four and twenty years. On the fall of the short-lived Tory administration, Lord Aberdeen came into office. He formed the famous Coalition Ministry. Lord Palmerston took what most people would have thought the uncongenial office of Home Secretary. Lord John Russell became Secretary of Foreign Affairs. Mr. Gladstone, who with others of the "Peelites," as they were called, had joined the new administration, was Chancellor of the Exchequer. His speech on the introduction of his first budget was waited for with great expectation, but it distanced all expectation. It occupied several hours in delivery, but none of those who listened to it would have wished it to be shortened by a sentence. It may be questioned whether even the younger Pitt, with all his magic of voice, and style, and phrase, could lend such charm to each successive budget as Mr. Gladstone was able to do. A budget speech from Mr. Gladstone came to be expected with the same kind of keen, artistic longing as waits the first performance of a new opera by some great composer. A budget speech by Mr. Gladstone was a triumph in the realm of the fine arts. The Crimean War broke up the Coalition Ministry; but the year 1859 saw Lord Palmerston back again in office, and Mr. Gladstone in his old place as Chancellor of the Exchequer. The budget of 1860 was remarkable, as it contained the provisions for the reduction of the wine duties and the whole simplified system of taxation intended to apply to the commercial treaty which Mr. Cobden had succeeded in persuading the Emperor of the French to accept. Mr. Gladstone also introduced a provision for the abolition of the duty on paper--a duty which was simply a tax upon reading, a tax upon popular education. The House of Lords struck out this clause; a somewhat impassioned popular agitation followed; and in the next session the Lords passed the measure for the repeal of the duty without offering any further opposition. The death of Lord Palmerston, in 1865, called Lord Russell to the position of prime-minister, and made Mr. Gladstone leader of the House of Commons. Mr. Gladstone's mind had long been turning in the direction of an extension, or rather expansion, of the suffrage. It was assumed by everyone that Lord Russell and Mr. Gladstone being now at the head of affairs, a reform bill would be sure to come. It did come; a very moderate and cautious bill, enlarging the area of the franchise in boroughs and counties. The Conservative party opposed it, and were supported in their opposition by a considerable section of the Liberals, who thought the measure was going too far on the road to universal suffrage and the rule of the democracy. The bill was defeated, and the Liberal statesman went out of office (1866). Mr. Gladstone had carried his point, however, for when Mr. Disraeli came into office he saw that a reform bill was inevitable, and he prepared his party, or most of them, for the course which would have to be taken. In the very next session Mr. Disraeli introduced a reform bill of his own, which was enlarged and expanded until it became practically a measure of household suffrage for cities and boroughs. Somewhere about this time the attention of Mr. Gladstone began to be attracted to the condition of Ireland. The distressed and distracted state of Ireland, the unceasing popular agitation and discontent, the Fenian insurrection, brought under England's very eyes by the schemes for an attack on Chester Castle--all these evidences of malady in Ireland's system led Mr. Gladstone to the conviction that the time had come when statesmanship must seek through Parliament for some process of remedy. Mr. Gladstone came after a while to the conclusion that the Protestant State Church in Ireland must be disestablished and disendowed, that the Irish land tenure system must be reformed, and that better provision must be made for the higher education of the Catholics of Ireland. He made short work with the Irish State Church. He defeated the government on a series of resolutions foreshadowing his policy; the government appealed to the country, the Liberals returned to power, and Mr. Gladstone became prime minister (1868). 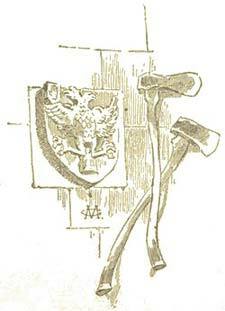 In his first session of government he disestablished and disendowed the State Church in Ireland. In the next session he passed a measure which for the first time recognized the right of the Irish tenant to the value of the improvements he had himself made at his own cost and labor. Never probably was there such a period of energetic reform in almost every direction as that which set in when Mr. Gladstone became prime-minister. For the first time in English history a system of national education was established. The Ballot Act was passed for the protection of voters. The system of purchase in the army was abolished by something, it must be owned, a little in the nature of a coup-d'etat. Then Mr. Gladstone introduced a measure to improve the condition of university education in Ireland. This bill was intended almost altogether for the benefit of Irish Catholics; but it did not go far enough to satisfy the demands of the Catholics, and in some of its provisions was declared incompatible with the principles of their Church. The Catholic members of the House of Commons voted against it, and with that help the Conservatives were able to throw out the bill (1873). Mr. Gladstone tendered his resignation of office. But Mr. Disraeli declined just then to take any responsibility, and Mr. Gladstone had to remain at the head of affairs. The great wave of reforming energy had, however, subsided in the country. The period of reaction had come. The by-elections began to tell against the Liberals. Mr. Gladstone suddenly dissolved Parliament and appealed to the country, and the answer to his appeal was the election of a Conservative majority. Mr. Disraeli came back to power, and Mr. Gladstone retired from the leadership of the House of Commons (1874). For a while Mr. Gladstone occupied himself in literary and historical studies, and he published essays and pamphlets. But even in his literary career Mr. Gladstone would appear to have always kept glancing at the House of Commons, as Charles V. in his monastery kept his eyes on the world of politics outside. The atrocious conduct of the Turkish officials in Bulgaria aroused his generous anger, and he flung down his books and rushed out from his study to preach a crusade against the Ottoman power in Europe. The waters rose and lifted him, whether he would or no, into power. The Parliament which had gone on from the spring of 1874 was dissolved in the spring of 1880, and the Liberals came in with an overwhelming majority. The period of reaction had gone, and the period of action was come again. Mr. Gladstone had to become prime-minister once more. His name was, to adopt the phraseology of continental politics, the only name that had come out of the voting urns. It was an unpropitious hour at which to return to office. There were troubles in Egypt; there was impending war in the Soudan and in South Africa. There was something very like an agrarian revolution going on in Ireland; and the Home Rule party in the House of Commons was under new, resolute, and uncompromising leadership. Mr. Gladstone succeeded, nevertheless, in carrying what might be called a vast scheme of parliamentary reform, a scheme which established something very near to universal suffrage, arranged the constituencies into proportionate divisions, extinguished several small boroughs, leaving their electors to vote in their county division, and in general completed the work begun in 1832, and carried further in 1867. It is to the credit of the Conservative party that after a while they co-operated cordially with Mr. Gladstone in his reforming work of 1885. This was a triumph for Mr. Gladstone of an entirely satisfactory character; but he had sore trials to counterbalance it. He found himself drawn into a series of wars in North and South Africa; and he, whose generous sympathy had of late been so much given to Ireland, and who had introduced and carried another land bill for Ireland, found that in endeavoring to pass the measures of coercion, which the authorities in Dublin Castle deemed advisable, he had to encounter the fiercest opposition from the Irish members of Parliament and the vast bulk of the Irish population. That time must have been, for a man of Mr. Gladstone's nature, a time of darkness and of pain. Lord Frederick Cavendish and Mr. Burke were assassinated in Dublin; General Gordon perished at Khartoum. In the end the Irish members coalesced with the Conservatives in a vote on a clause in the budget, and Mr. Gladstone's government was defeated. Lord Salisbury came back into office, but not just then into power. He was in a most precarious position, depending on the course which might be taken by the Irish members. He was out of office in a few months, and then the general elections came on. These elections were to give the first opportunity to the newly made voters under Mr. Gladstone's latest reform act; and these voters sent him back into office and apparently into power once again. The use Mr. Gladstone made of office and of power astonished his enemies, and startled and shocked not a few of his friends. His government had had, in the years between 1881 and 1884, to fight a fierce battle against the policy of obstruction organized by Mr. Parnell, the leader of the Home Rule party. The obstruction was organized to prevent or delay the passing of coercion measures, and to force the attention of the British public to the claims of Ireland. The struggles that were carried on will be always memorable in the history of Parliament. The fiercest passions were aroused on both sides, and at one time Ireland seemed to have come to regard Mr. Gladstone as her worst enemy. Many a statesman in his place might have allowed himself to be governed by a feeling of disappointment and resentment. But when the elections under the new and extended Reform Bill were held, and the Irish Nationalist party came back 87 members out of the whole Irish representation of 103, Mr. Gladstone made up his mind that the voice of the Irish people was in favor of Home Rule, and he resolved to stake power and popularity on an acceptance of their demand. In March, 1886, he brought in a measure to give a statutory Parliament to Ireland. A sudden and serious split took place in his party; some of his most influential colleagues declared against him; the bill was rejected on the second reading, and Mr. Gladstone appealed to the country, only to be defeated at the general elections. Opinion is still divided--may be divided forever--as to the wisdom of his policy; but no impartial man can deny him the credit of his sacrifice and the sincerity of his intentions. Then the Conservative party came back into office, and with the help of Liberals who had declined to follow Mr. Gladstone, came back with a powerful majority, Mr. Gladstone leading the opposition. At the general election of 1892, his party, including both sections of Irish Nationalists, secured a majority of above forty over the combined Conservatives and Liberal Unionists. Under his leadership a home-rule bill for Ireland was passed by the Commons in spite of the most bitter opposition. It was rejected almost unanimously by the House of Lords; and for a time it seemed probable that the Liberals would attack the very existence of that body. Perhaps this was Mr. Gladstone's intention for he introduced several popular radical bills. But time was beginning to tell upon the Grand Old Man; he was now eighty-four years old, and he felt himself unequal to the gigantic struggle. He resigned his offices and retired into private life in March, 1894. Mr. Gladstone will find his fame as a statesman and an orator. We have taken little account here of his contributions to literature; his Homeric studies, his various essays in political and literary, in ecclesiastical, and even theological, criticism. For another man these in themselves would have made a not inconsiderable reputation; but to the world they are interesting chiefly as illustrating a marvellous mental activity stretching itself out in every direction; unresting in the best sense of the word; incapable of settling down into even momentary idleness. "Repos ailleurs" seems to have been the motto of Mr. Gladstone's career--let rest come elsewhere--this is the world of activity and of labor. His work as a statesman has been almost unique; probably there is no other English minister who leaves behind him so long and so successful a record of practical legislation; and, as we have seen, some of the best legislation accomplished by his political opponents was initiated by him, was his own work taken out of his hands. As a parliamentary debater he never had a superior--it is doubtful whether he ever had an equal--in the whole of the political history of the British Empire. There have been, even in our time, orators who now and then shot their arrows higher; but so ready, so skilful, and so unerring an archer as he, taken all around, never drew bow on modern parliamentary battle-ground. Nature had given him an exquisite voice, sweet, powerful, easily penetrating, capable of filling without effort any public building however large, vibrating to every emotion. The incessant training of the House of Commons turned nature's gifts to their fullest account. He was almost too fluent; his eloquence sometimes carried him away on its impassioned tide; but his listeners were seldom inclined to find fault with this magnificent exuberance. We should be inclined to rank him as one of the greatest orators, and the very greatest debater, of the House of Commons.